Carol Mackenzie Gale B.A. (Hons) M.A. : WHALE TANKERS. TANKER ART. Naum Gabo 'Circular Relief', 1925. Nina Williams. www.tate.org.uk/Stives. Gabo and Pevsner ....'space and time are fundamental to life. Art aimed at being one with the esssence of the real must accept this basic premise'......'in London (approx. 1938-40) he was introduced to persex, a new plastic from ICI, and used this material in some of his best known works. He used transparent plastic tubing or plasic sheet made into warped, parabolicx planes, shot through with parallel nylon threading. 'But what are concepts save formulations and creations of thought, which, instead of giving us the true forms of objects, show us rather the forms of thought itself.? Consequently all schemata which science evolves in order to classify, organise and summarise the phenomena of the real world turn out to be nothing but arbitrary schemes - airy fabrics of the mind, which express not the nature of things, but the nature of mind'. Is this a sculpture or a pile of tanker rears? I love it and think it is worthy of a place in any gallery. This is beautiful! Inside a tanker waiting for repair or renovation. One of the things that struck me whilst photographing tankers and tanker components at Whale was how sculptural some of the parts are. They are parts of road tankers and yet are or could they not be works of art in a gallery? 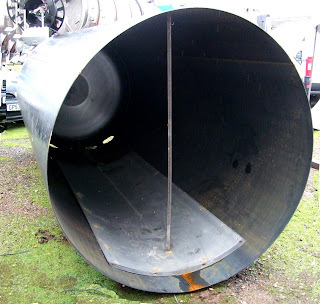 The quality finish insisted upon by the tanker companies could be the finish desired for an art piece. The question is, what is art? 'The exercise of human skill'. Everything you look at has been designed by someone. Beauty is truly in the eye of the beholder. Some of the rear pieces of the tankers are so amazing to me. This could surely be a sculpture? It has been created with a use, a purpose. It will grow up to be a tanker. A work of art - or a tanker body waiting to be made into a tanker. 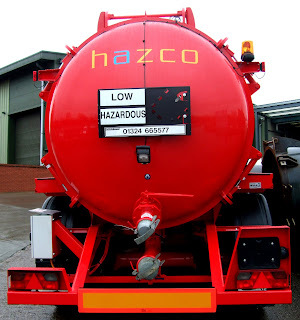 A beautiful scarlet Hazco tanker destined for a life removing hazardous waste? An Anish Kapoor Sculpture courtesy of 'Imagine', BBC1. 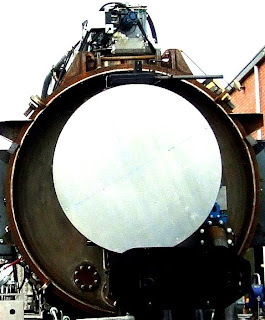 A stainless steel rear dish of a tanker. Anish Kapoor sculpture. 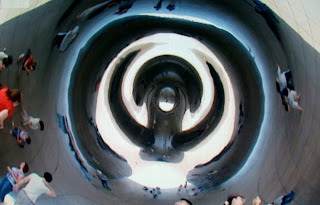 'Cloud Gate', Millennium Park, Chicago. (The Bean). Picture courtesy of 'Imagine' BBC1. His pieces are highly prized and a considerable amount of time is spent on the perfection of the finish. This is a reflective walk through piece. The estimate was 3M, budget 9M and it cost 23M. 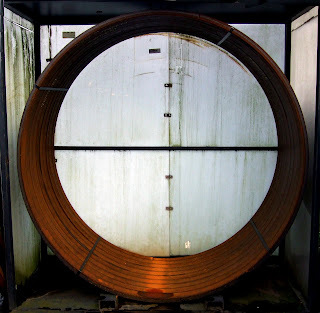 The store of rusting rings, supports for the tanker body. Is the stamp 'work of art' governed by the 'Way of Seeing' or is it of 'Intent'. A defence in burglary is in whether the defendent has 'the intention to permanently deprive the victim thereof' or in murder 'the intention to take the life of another'. so is a work of art intended to be a work of art and thus is?